The Code of Conduct forms part of the Constitution. It sets out the assumptions which shall inform the conduct of the Northampton Inter Faith Forum. In Britain today, people of many different faiths and beliefs live side by side. The opportunity lies before us to work together to build a society rooted in the values we treasure. But this society can only be built on a sure foundation of mutual respect, openness and trust. This means finding ways to live our lives of faith with integrity, and allowing others to do so too. Our different religious traditions offer us many resources for this and teach us the importance of good relationships characterised by honesty, compassion and generosity of spirit. 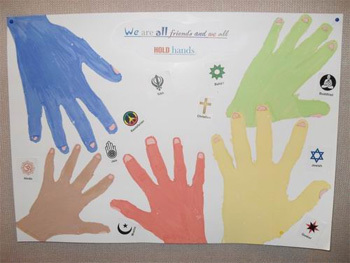 The Inter Faith Network offers the following code of conduct for encouraging and strengthening these relationships. Accepting that in formal inter faith meetings there is a particular responsibility to ensure that the religious commitment of all who are present will be respected. Living and working together is not always easy. Religion harnesses deep emotions which can sometimes take destructive forms. Where this happens, we must draw on our faith to bring about reconciliation and understanding. The truest fruits of religion are healing and positive. We have a great deal to learn from one another which can enrich us without undermining our own identities. Together, listening and responding with openness and respect, we can move forward to work in ways that acknowledge genuine differences but build on shared hopes and values.